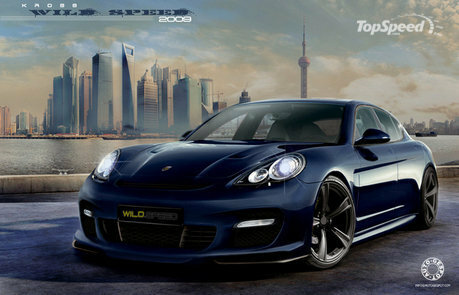 Even before the Porsche Panamera hits showrooms around the world tuning enthusiasts are toying around with modifying the new four door sports car making it into a much more focused package. If you can put your imagination to work like this rendering’s artists did, you would have envisioned the German automaker’s latest creation sporting a more aggressive front bumper complete with grip enhancing front splitter and an oversized set of rims filling every inch of wheel well. Even if this is just rendering, expect aftermarket manufacturers to be ready with a few products for owners to accessorize the new Panamera and personalize their vehicle, but it may take a few months for a full kit like this. It takes time to prepare bumper moldings and lay the carbon fiber for the splitter, but a well thought out suspension could take quite a bit more time.